If a forensic investigation were to be performed to find the root cause of the disastrous failure of 20th-century cosmology (and some aspects of astrophysics), it would lead to a famous experiment in 1887 and its subsequent misinterpretation. An enquiry into history reveals the discounting of an experiment's data, a disregard of its cautionary conclusion and the adoption by the scientific community of an unjustified interpretation —the denial of the existence of aether and absolute motion— with regrettable consequences. The discovery of the causal mechanism of gravity was delayed by well over one hundred years as theorists devoted themselves to the modeling of mathematical space. Without the existence of an aethereal space-fluid, the Science of Cosmology henceforth dedicated itself to the creation of hypothetical mathematical universes. Perhaps the most appalling consequence is the failure to recognize the Universe's self-organizing preferential structure; the failure to recognize that the Universe, consisting, as it does, of aether that is regionally dynamic on the large scale, is a cellular universe. Thus, profoundly affected was the understanding of gravity theory, cosmology, and cosmic structure. Meanwhile, the aether had been re-discovered at least six times during the 20th century. And it is only relatively recently that this knowledge has been incorporated into a restructuring of fundamental physics. The emergence of a modern aether theory has led Professor Reginald T. Cahill to the causal mechanism of gravity and the author to the intrinsic cellular structure of the Universe. The discipline or method (for gaining understanding) that we call science may be said to have originated in the reasoned belief that the world and everything it contains is ruled —not by temperamental gods and their magical powers— but by natural laws and predictable forces. For those cultures tracing their intellectual roots to Ancient Greece, this embrace of science, of the rational way of asking questions and seeking answers, occurred more than 27 centuries ago. The triumph of the concept of natural laws over supernatural gods paved the way for all the scientific advances that have occurred since and have defined the modern world. Science was originally called natural philosophy as for example in Newton's famous work The Mathematical Principles of Natural philosophy and during the many long centuries, encompassed mathematics and geometry and anything else that was useful, as well as what we now recognize to be distinctly non-scientific. Over time natural philosophy evolved and transformed into the various distinct branches and sub-branches of science. The advances in the sciences during the 16th and 17th centuries were so significant that the period became known as the Scientific Revolution. There were rapid advances, or at least they seem so in retrospect, in the diverse fields of astronomy, physics, mathematics, chemistry, biology, medicine, and earth sciences. However, most of the various branches of science did not become modern disciplines during the so called revolution. Each depended on some specific discovery or the adoption of some new paradigm concept (or both) before graduating to the status of a 'modern' field of study. To better appreciate the following discussion there is something else one should know about science and science's defining feature: It is a process of selection. But more importantly, science is a process of selection with a built-in self-correcting mechanism. It works like this: The laws, theories, models, hypotheses, and predictions that constitute science are always under scrutiny, always being tested and refined, always striving for confirmation, all the while, waiting in the wings, are challengers —rival theories and ideas ready to take advantage of any discrepancy and any weakness. Theories and models that don't hold up are either modified or discarded. Or at least that is how science is supposed to work. This correcting process does explain how astrology, the occupational roots of the science of astronomy, was expurgated. It explains why the mysticism of alchemy is absent from the science of chemistry; why the Lamarckian theory of acquired characteristics is a footnote in the evolution branch of biology. The selection process generally works well; however, when it fails (that is to say when men fail to apply the selection process) then a discipline relinquishes its former status and becomes a faith-based discipline. It becomes more of a religion than a science. Science, representing as it does, the investigation of reality, demands that there be a disciplined selection process —one that it is intrinsically self-correcting. Returning to the transition from scientific revolution to modern science: As one would expect, each branch became a recognizable modern science as a consequence of some pivotal discovery or development at some time in its history. By the mid-20th century every branch of science had achieved the respectability of maturity and had become a modern discipline. … Well not quite —there was one exception. Modern biology began during the 19th century with the accumulation of evidence that all living organism, all plants and animals, are structured as cells or aggregations of cells. Modern medical science began in two stages. In the first, there was the 19th-century discovery and reluctant acceptance of the germ theory of disease —this paradigm shift gave medicine a solid scientific footing. In the second, there was the discovery in 1953 of the structure of the DNA molecule. James Watson and Francis Crick opened the door to the molecular code of all life —the code which when skillfully altered gives the medical practitioner the potential ability to treat and correct the cause of any genetic disease rather than merely ameliorate its symptoms. Modern physics began early in the 20th century with the realization that mass and energy are equivalent —that mass is but a frozen form of energy. Modern astronomy began, also in the early part of the 20th century, with the discovery that the light from distant galaxies was redshifted and that the degree of redshift (which is actually measured as a change in the wavelength) could be used as a measure of distance. It could be used to determine the relative distances to far off galaxies —and gauge the depth of the heavens. With knowledge of this basic universal effect it became possible to view the universe in all three dimensions. Modern geology began with the confirmation of continental drift and the theory of plate tectonics developed in the 1950s. Actually the theory of continental drift was proposed many years earlier in 1915 by the German geologist Alfred Wegener (1880-1930), but had been ignored. Modern chemistry began, near the end of the 19th century, with the discovery of the electron. Modern optics began with the gradual realization that the physics of light demanded a wave-particle duality theory. A rare situation in which two rival theories were both right; led to the combining of the corpuscular theory with the wave theory of light. And finally there is the study of cosmology —the science of the Universe. It is the science that subjects physical (even philosophical) laws to their extremes. Cosmology is the science that applies physical laws to the most extreme conditions conceivable, including pressure, temperature, infinite vastness, quantum minuteness, and the fantastic extremes of gravity from the anti-gravity of Lambda to the crushing gravity of neutron stars. Remarkably, it is also the science in which the subject, at some deep fundamental level, actually determines those same laws of physics. We could say that cosmology is the one science —the exceptional science— that determines physics rather than the usual case of physics determining the science. Cosmology is exceptional for another reason. It has an exceptional chronological status. While all the other sciences had achieved modern maturity by the 20th century, cosmology had not. Cosmology is the lone exception. Modern cosmology did not begin until the year 2002 —the year in which two major discoveries were made. In the second year of the third millennium, 315 years after Newton's formulation of 'classical' gravitation (but which gave no cause) and 87 years after Einstein's publication of the general relativity theory of gravity (which also failed to explain its cause), the causal mechanism of gravitation was discovered. This monumental achievement stems from the research of Professor Reginald T. Cahill of Flinders University in Australia. The second major contribution, in that same year, was the unveiling (at the Munich Symposium on Astronomy, Cosmology and Fundamental Physics) of the cellular model of the universe known as the Dynamic Steady State Universe (DSSU). On being informed of the dismal performance of their field of study or interest, students and scholars of Cosmology initially react with disbelief. Disbelief instinctively turns to defensive rationalizations about the Big Bang (BB) cosmology being well established; about the soundness of abundant evidence, the interpretations of which serve as the supporting pillars; about the consensus among scientists on its validity. Books have been written on how the cosmology that emerged during the 20th century has been proven to be valid (for example, Simon Singh, The Big Bang); defenders have pointed out its high degree of mathematical certainty and self-consistency; in 1978, a Nobel award was bestowed in connection with its development; it is even supported by Holy Scripture, according to the pronouncements of Pope Pius XII in 1951, Pope John Paul II in 1981 and again in 1985; websites have appeared reassuring any doubters and heretics that the BB is not a modern myth. Yet in spite of all the apparent success and abundant support, defenders of expanding-universe cosmology readily admit that as unworkable, as "unnatural," as "preposterous" as the BB seems to be, it is still the best available model! Beneath all the congratulatory promotion, any cursory examination of the scientific arguments underpinning the BB model (in fact, any expanding-universe model) will reveal gross omissions and outright non sequiturs. The arguments fail. They all fail for one simple reason. Any and all meaningful theories of the universe must, in one way or another, be based on a comprehensive understanding (codified as a theory) of gravitation. When that central theory is incomplete —when it is missing the essential causal mechanism— then the model of the universe of which it is the cornerstone must likewise be incomplete. And worse, it may be seriously flawed. A cosmology without a meaningful cause of gravity is missing most of its foundation. A cosmology that is missing a complete theory of gravity cannot claim to be a modern science. Newton by his own admission gave no cause for his force and Einstein by his own admission gave no cause for the ability of mass to 'curve' space. This must give pause to BB believers. Their grand theory of the Universe, after all, is based on Einstein’s gravity theory. They must surely wonder, what are the consequences of not knowing "the cause"? Wonder turns to bewilderment with the dawning that one's cherished beliefs are threatened. The consequences are too ghastly to contemplate. ... Can it be ... Can it actually be that Physics and Cosmology somehow got it wrong? —retarding the advancement of Cosmology those many years? Without its causal explanation, Newton's gravity became known as "spooky action at a distance." Spooky because it was a complete mystery what was conveying the force-effect across spans of absolute space; and furthermore, the force-effect was conveyed instantaneously. Without a causal explanation, Einstein's gravity becomes a mathematical mystery (albeit a highly accurate one, a mystery nevertheless) of curved space-time. Ask a physicist what causes the gravitational effect: What causes objects to freefall to the ground? The technical answer will be, the curvature of space caused by the presence of the Earth's mass. ... But what is curvature? ... Numbers, a geometric concept, geometrized numbers. ... And what do the numbers mean? ... Well, they symbolize and quantify the curvature. Yes, of course, theorists are aware of the theory's deficiency —its missing cause. In fact, it is their painful awareness that is driving the perennial search for gravity waves and gravity particles. So far, only null results have been reported. Why did Cosmology lag behind all the other sciences? True enough, as just mentioned, they missed the cause of gravity; but they also missed the intrinsic cellular structure. How on Earth could they have failed in recognizing these? There are two essential aspects of our universe that have been overlooked. Let me qualify this statement. There is one aspect or property of our universe that involves not the negligence of having missed something of vital importance but rather the actual suppression of scientific findings. This has been going on for so long that awareness has faded. Yet every so often this property is 'rediscovered'. The second aspect, which will be examined in Section 8, appears to have been an honest oversight —the type of slip-up of which everyone asks how could we have missed that? I’m talking about something quite self-evident; something that follows naturally from the first feature. At the forefront of the search was the Michelson-Morley (M-M) experiment, one of the most important scientific investigations of the 19th century. It undoubtedly was and remains the most controversial. If a forensic inquiry were to be performed to find the root cause of the disastrous failure of 20th-century cosmology it would inevitably lead to this famous set of experiments. In 1887 two physicists, Albert Michelson and Edward Morley, performed what has turned out to be one of the most historic but misunderstood experiments in physics. In that era, physicists believed that motion relative to space should be measurable —one should be able to determine one’s speed-of-motion through space. Michelson had conceived of an apparatus that he believed could carry out just such a measurement. It is called an interferometer, and works by splitting a beam of light into two orthogonal paths, and recombining the light, after reflections from mirrors, onto a screen, where fringes of light and dark (the interference effects) are indeed seen. To detect translational motion the device is slowly rotated. If the speed of light is fixed relative to space (that is, aether) and if the apparatus is in translation motion relative to the aether, then the difference in travel times of light waves along the two arms should manifest as a back-and-forth shift of the fringes on the screen. Since the Earth is traveling along an orbit about the Sun, it would seem that the M-M apparatus was undergoing the requisite motion. So what did they actually see? ... Their paper reports fringe shifts exactly of the form expected. So absolute motion through aether had been detected. From the magnitude of the observed fringe shifts (using contemporary Newtonian physics), Michelson computed that the speed of the apparatus through space was approximately 8 kilometers per second —an enormous speed. Michelson noted, however, that this was less than the orbital speed of 30 kilometers per second of the Earth about the Sun, and he had expected to observe at least this amount of speed. Instead of concluding that absolute motion had been detected and that the calibration of the instrument might be in error (which as it turned out was the case), Michelson reported that the fringe shifts were erroneous and absolute motion had not been detected. Michelson reported what eventually became known as the "null" result. Based on an unjustified conclusion and the consequential rejection of the existence of absolute motion and aether, the nascent science of Cosmology turned away from the substantive to dedicate itself to the creation of mathematical space and mathematical universes (see the flowchart below). With the geometric methods of Janos Bolyai (1802-1860) and Lobachevski (1793-1856) and Riemann (1826-1866) leading the way, and the additional contributions and influence of H. Minkowski (young Einstein's mathematics professor), the 20th century became the golden age for mathematical representations of space and the Universe. As it happened, Einstein was among the first to mate the hyper-dimensional mathematics with the M-M misinterpretation. The aether experiment made a lasting impression and guided his work of geometrizing space-and-time and of developing the 4-dimensional field concept of gravitation. For the historical record it is convenient, and probably accurate, to say that Einstein's application of his mathematical gravity theory to the universe-as-a-whole marked the beginning of cosmology as a legitimate science. What had been a branch of philosophy now became a branch of physics. Einstein, as part of his gravity theory, had made three famous predictions. Over the years the predictions were confirmed, the relativity theories gained acceptance, Einstein’s reputation and fame grew, and, in time, his ideas came to dominate the field. Few dared to challenge his geometrizing of space and time and the universe. The mathematical universes based on general relativity flourished. First there was the Einstein cosmology of 1916-1917. The years and decades that followed saw the rapid introduction of the DeSitter universe, the several Friedmann universes, the Oscillating, the Lemaître, the Brans-Dicke, the Eddington, and the Steady State universes as well as lesser known others. And the current model being used by theorists, the Lambda cold dark matter model, is of the same genus —and is ultimately based on the flawed M-M null interpretation. The M-M experiment, probably the most important experiment of the 19th century, clearly had profound and far-reaching consequences for the modeling of reality. It was controversial back then and remains controversial to this day. But as an experiment for the detection of aether and absolute motion the M-M experiment was not alone. There have been a number of others. And one of these is the Dayton Miller experiment. In order to understand what motivated the Miller experiments, we take a closer look at Michelson and Morley's concluding remarks. In their paper of 1887, they made an important qualification: “In what precedes, only the orbital motion of the earth is considered. If this is combined with the motion of the solar system, concerning which but little is known with certainty, the result would have to be modified; and it is just possible that the resultant velocity at the time of observations was small though the chances are much against it. The experiment will therefore be repeated at intervals of three months, and thus all uncertainty will be avoided.”  Unfortunately, this repetition (which later was to prove to be very important) was never carried out. Although Michelson never did carry out the recommendations contained in his concluding remarks, others did and it is their experiments (performed during the 20th century) that accumulated definitive evidence and confirmed the existence of aether. And the most extraordinary of these is the series of experiments carried out over a 30 year period by Dayton Miller, from 1904 to the mid 1930s, using far more sensitive apparatus than the one used by Michelson and Morley, and which clearly and consistently showed an aether drift effect. His measurements taken in the years 1925 and 1926 atop Mt. Wilson in California were particularly significant, and again detected the anisotropy of the speed of light —the signature of aether and absolute motion. As Professor Cahill explains, “Had Michelson and Morley been as astute as their younger colleague [Dayton] Miller, and had been more careful in reporting their non-null data, the history of physics over the last 100 years would have been totally different.”  And in particular our understanding of space and gravitation would now be totally different. Unfortunately the Miller experiments came too late, took too long, and contained a calculation error. And since the results contradicted Einstein and Relativity, they were at first ignored. By the time Miller had sorted out the M-M misinterpretation, the world of physics (and cosmology) had adopted the four-dimensional ontology —in which all motion is relative and absolute motion is meaningless. The experiments of Michelson and Morley and of Dayton Miller, have been repeated and analyzed in modern times by French engineer Maurice Allais (Nobel Prize recipient for Economic Science in 1988). It is primarily due to the work of Allais that Miller's discoveries have been brought to a modern audience. For further details see the Allais website: http://allais.maurice.free.fr/English/Science.htm . The story of Dayton Miller and what happened to his findings has also been researched and told in considerable detail by Dr. James De Meo, Director of the Orgone Biophysical Research Lab. His research paper can be found here: www.orgonelab.org/miller.htm . British researcher Richard Milton has prepared a historical analysis of the Michelson and Morley Experiments and the Aether Theory. It is an investigative tale that traces the source and the flow of the alleged null result; and details the relentless misrepresentation, bias and cover-up that hampered the Aether theory. See R. Milton’s article entitled Michelson-Morley and the Story of the Aether Theory: www.CellularUniverse.org/AA2MM&Aether.htm . Clearly the amplitude of the fringe shift, in all the successful aether experiments, did not match prediction —but there is no question about the fact of the presence of the shift. But what is most amazing —and Richard Milton fails to mention this— is that the sinusoidal pattern of the fringe shifts versus the angle of apparatus rotation did approximate the prediction, particularly for the Miller data! Furthermore, the aether flow readings produced a minimum-and-maximum cyclical pattern over a nominal 24-hour period; somewhat analogous to the way the waxing and waning of the ocean tides will produce a sinusoidal rise-and-fall pattern. My honored Dr. Michelson, it was you who led the physicists into new paths, and through your marvelous experimental work paved the way for the development of the theory of relativity. Various other experiments have succeeded in detecting absolute motion relative to space. Most notable are the experiments by Illingworth, Jaseja et al, Torr and Kolen, and by DeWitte. The Roland DeWitte data (as well as those of Dayton Miller) also reveal an in-flow of aether into matter; an in-flow which manifests as gravity. The in-flow also manifests turbulence and the experimental data confirms this as well, which amounts to the observation of a gravitational wave phenomenon. In 1991 Roland De Witte carried out an experiment in Brussels in which variations in the one-way speed of radio-frequency waves through a coaxial cable were recorded over 178 days. The data from this experiment show that De Witte had detected absolute motion of the earth through space. His results are in excellent agreement with the extensive data from the Miller 1925/26 detection of absolute motion using a gas-mode Michelson interferometer atop Mt. Wilson, California. The De Witte data reveal turbulence in the flow which amounted to the detection of gravitational waves. Similar effects were also seen by Miller, and by Torr and Kolen in their coaxial cable experiment. These experiments, with their extensive data, add further support to the conclusion: The Einstein assumptions leading to the Special and General Theory of Relativity are thus shown to be false. Contrary to the Einstein assumptions, absolute motion is consistent with relativistic effects, which are caused by actual dynamical effects of absolute motion through the quantum foam, so that it is Lorentzian relativity that is seen to be essentially correct. There are also aether experiments which support aether theory in another way. It is important to note that when the M-M interferometer is enclosed in a vacuum chamber, or even a near-vacuum chamber (or if placed in outer space), it serves as an instrument to confirm the Fitzgerald-Lorentzian length-contraction resulting from the absolute motion through aether. Regardless of orientation the instrument will give a near zero reading —it gives virtually no fringe shift. For instance, H. P. Kennedy and E. M. Thorndike obtained null results with a vacuum-mode apparatus. This is predicted by the modern aether theory and supported by experimental evidence. But the vast majority of physicists having rejected the concept of aether, came to a very different conclusion. · Absolute-motion effects are not observed with vacuum interferometers; a gas must be present in the Michelson-type interferometers. This is entirely consistent with aether theory. R.T. Cahill and Finn Stokes, Correlated Detection of sub-mHz Gravitational Waves by Two Optical-Fiber Interferometers, Progress in Physics, Vol.4, Issue 2, pp103-110 (2008). Approximately 115 years after the historical aether experiment Reginald T. Cahill joined the search. He, as others before him, found that the M-M results had been misreported. Motivated by the explanatory power of the new Process Physics, which he had been instrumental in developing, Professor Cahill undertook the tedious task of re-analyzing the considerable data from the M-M and the Miller experiments. But more importantly he questioned the interferometer's mode of calibration and quickly came to the conclusion that it was flawed. The true nature of its operation was found and the calibration was eventually quantified. The understanding of the operation of the Michelson interferometer in gas-mode was only achieved in 2002 and involved 1) the refractive index of the gas in the light paths; it was essential to have the light travel through a gas and to have the value of its index of refraction; and 2) Special Relativity effects; the Fitzgerald-Lorentz contraction had to be considered. Cahill was thus able to recalculate the aether velocities from the M-M and the Miller experiments. Once the various vector components were separated it was determined that the absolute speed of the Solar System through space is some 430 kilometers per second in an almost North-South direction (in agreement with the six other experiments listed above). Furthermore, the results demonstrate the reality of the Fitzgerald-Lorentz length contraction as an observer-independent relativistic effect. The apparatus arm parallel to the aether flow is physically shortened in relationship to the speed. Contrary to the Einstein assumptions, absolute motion is entirely consistent with the usual relativistic effects (clocks slow down, lengths contract), which are caused by actual dynamical effects of absolute motion through the aether. It is Lorentzian relativity that is seen to be essentially correct, while the Einstein assumptions leading to the Special and General Theory of Relativity are wholly unnecessary. But most remarkably Cahill's re-analysis provided the observational confirmation of the most startling prediction of Process Physics about the dynamics of space: Aether is, to use Cahill’s term, a quantum foam system in which gravity is an inhomogeneous flow of the quantum foam into matter. Aether contracts by dissipation as it flows towards and into matter. By attributing to aether an absoluteness quality —a real and measurable and dynamic quality— the science of physics has acquired the long sought causal mechanism of gravitation. ... As much as I would enjoy dwelling on this truly great achievement, I must turn to the second essential feature of our Universe. One thing is clear; these developments will completely change fundamental physics and our understanding of reality. Prevailing paradigms in current physics are being overturned. And the science of cosmology? ... For cosmology the change would more accurately be described as a total revolution. As mentioned earlier the first of the two essential aspects of our universe, the absolute nature of space, is actively being suppressed. During the previous century there was a systematic bias against absolute motion and the aether concept as detailed in several articles mentioned earlier; but now in the new millennium, bias has turned ugly. Revisionist physicists and cosmologists are now faced with suppression-by-censorship. (At least it's not as bad as it is for historians who in some parts of the Western world face censorship-by-threat-of-imprisonment —suppression by the laws of their own respective countries.) Are these the signs of a pending revolution? To this day absolute motion is a banned concept in physics, editors of 'mainstream' physics journals will reject any paper claiming the reality and observability of absolute motion, internet archives censor their submissions and remove the offending papers, and conference bans are placed on any persons who report experimental evidence for absolute motion. So why is absolute motion and aether still a banned concept in physics? The answer appears to be that Einstein's ideas resulted in essentially a cult following within the physics community. Its members ruthlessly attack any evidence that is not in agreement with their belief system. The deplorable result: progress in understanding space and gravitation has stalled for the last 100 years or so. The result has been the failure of cosmology throughout the 20th century. For the sake of brevity let us skip the views on aether held by the Ancients and the historical practitioners of the Ptolemaic cosmology, and just mention, in passing, Descartes’ vortices of aether, or cosmic whirlpools, that moved the planets, and proceed to consider Newton's view of the aether. Newton turned to the aether concept as a way of addressing the "immediate action at a distance" problem and as a way of providing the causal mechanism for his universal gravity theory. He came up with two ideas. Newton thought of the aether as either consisting of particles and by the impulses of a stream of these particles bombarding an object the force of gravity is conveyed; or alternatively, as an all-pervading fluid possessing some unknown variable property. Unsubstantiated as they were, he did not advance either of these notions in the Principia. Augustin Cauchy (1789-1857), presumably searching for that "variable property" of space that had eluded Newton, developed three aether theories: 1) Aether changes in density; 2) Aether changes in elasticity; 3) Then in a 1839 theory, aether was contractile, "possessing a negative compressibility." Today we would call this a negative Lambda effect or a simplified gravity effect. Physicist George Green (1793-1841) pointed out that Cauchy's contractile aether would be unstable, tending to contract all the time. George Stokes (1819-1903) hypothesized in 1845 that aether was rigid enough to transmit light waves, but could not be compressed or expanded and simply yielded to permit the movement of objects within it. Many other aether models were proposed during the latter half of the 19th century. With the rival field theory gaining popularity, and the fallout from the M-M misinterpretation, and finally the paradigm shift towards the 4-dimensional geometrization of space-time, the aether idea suffered crippling setbacks. During the 20th century there was practically no further development in the aether model. For the dwindling number of adherents, aether was still viewed as the medium for the propagation of electromagnetic waves, but was also viewed as the seat of the 'zero-point' fluctuations of electric charge and current. And of course, being a fluid, aether could flow —and the experimental evidence repeatedly proved it. Then, in 2002, aether underwent a fundamental change —aether became dynamic. Researchers in Australia had performed a meticulous re-analysis of the M-M measurements and the Miller data and applied new and powerful concepts of Process Physics. As described earlier, aether was once more rediscovered, but this time it was recognized as having specific dynamic properties. In the very same year, and in another part of the world, a new cosmology model was being developed. Newton's "variations in an all-pervading aether" was identified. The gravity-manifesting distortions of the aether were finally found. The new cosmology's two key postulates spelled out the dynamic properties (or processes) of aether. Now, to proclaim that space is dynamic should not, and does not, raise any eyebrows. Einstein assures us, space is dynamic. It is a fact often repeated. So when DSSU theory postulates that aether (aether as the space medium) is dynamic we should feel reasonably secure in the validity of the assertion. We are on a safe theoretical footing. Space, whether of the aether type or the non-aether type, is predicted to be dynamic. Never overlook the fact that the relativity theories do not disprove the existence of aether but merely consider it to be superfluous. Einstein may have been wrong when he denied the absoluteness of space, but he was brilliant with respect to its dynamic qualities. His theory allows space to expand as well as to contract. We are also on secure observational footing. Regions of space are actually observed to be dynamic. Astronomers, for instance, 'observe' the expansion of space when they measure the cosmic redshift imprinted onto the light from distant galaxies. In fact the experts are so convinced of the ubiquity and extent of the space-expansion that they believe the whole visible universe is expanding! It is also why they make space expansion the main pillar of cosmology —and rightly so. ... And the contraction of space? Astronomers 'observe' the contraction of space in the phenomenon called gravitational lensing. Astronomers and non-astronomers alike observe the contraction of space in the gravitational freefall of objects such as the ones that were supposedly dropped from that famous Pisa Tower long ago —hence giving meaning to the science term contractile gravitation. In contrast to Einstein's geometrized view, the expansion and contraction of aether is a very real property —a very real dynamic action of a universal medium. This is a new kind of aether theory. One could say that for the first time in history there is a dual-dynamic aether theory. The consequences for cosmology are without precedence. Here is what we have so far: There is a dual dynamic process taking place in a fluid (aether) having some degree of absoluteness. This process is occurring in a universe that is isotropic and homogeneous on the largest scale (in compliance with the cosmological principle). And we particularly note that there is a regional division between one dynamic process expansion and the other dynamic process contraction. And what happens when there are two opposing dynamic effects in a homogeneous substance? ... Looking at the evidence presented by Nature we find, for example, that a ‘hot-cold’ fluid produces thermal convection cells; gas pressure versus surface tension forms soap bubbles; freeze-thaw cycles result in a polygon Tundra-terrain; atomic forces versus macro stresses transform amorphous ice into crystalline candled ice. All of these diverse examples have one thing in common —the formation of cells. We should therefore expect that the dual dynamic processes of expansion and contraction will likewise be responsible for cell structure. We should expect the Universe to be divided into cells (see Fig. 1). And thus the first 'overlooked' aspect leads naturally to the second. The existence of the pervasive aether fluid, endowed with the ability to dynamically expand and contract, leads naturally to the cellular cosmic structure. And this too is observed. Numerous reports from astronomers tell of vast empty regions, the voids, separated by webs and sheets of linked galaxy clusters. The many voids and their surrounding galaxy clusters are the manifestations of cosmic cells. Fig. 1. Conceptional view of the cellular universe. The Dynamic Steady State Universe consists of the simultaneous, but spatially-separated, expansion and contraction of the universal medium. These balanced dynamic processes produce a quasi-static polyhedral pattern. According to DSSU theory and astronomical observations, our Universe is cellularly structured. Although the medium expands in the interior (the Void) of the cells, in general, the cells themselves do not increase in size. At the boundaries of the cells, where gravity dominates, the medium is contracting. The cells maintain equilibrium; consequently the universe does not expand. We saw earlier that the nineteenth century witnessed several unsuccessful attempts, namely the Cauchy versions, to model possible dynamic properties of aether. Since there are different ways of achieving expansion and contraction (which, when you think about it, is really the only dynamic activity permitted of a nonmaterial fluid), it is important to clarify what is meant by such dynamical distortions of aether as postulated under the new theory. The dynamic properties of DSSU’s aether are unlike those of Cauchy’s aether, which is postulated to achieve contraction and expansion by means of a change in density or alternatively a change in elasticity. DSSU aether is not expanded by stretching and contracted by compression. It is not contractile in the sense of a change in density induced by compression. And the expansion is not associated with any elastic property of aether. In the Dynamic Steady State Universe model space expansion represents, on the macro-scale, a real growth in the 3-dimensional quantity of aether —and a growth in the number of discrete units on the micro-scale. While in like manner, space contraction is a reduction in the quantity of aether. It follows that DSSU's universal space medium is not a continuum, but rather, it is quantized or micro-cellularized. When we apply this dual-dynamic aether to the Universe, we come to the other essential cosmological aspect. If the first essential feature of the Universe is the existence of aether, or more specifically dynamic aether, then the second essential feature is that the Cosmos is cellularly structured. What is truly astounding, and was only recognized two years after the initial discovery, is that there are three distinct cellular structural levels. (For the present we are only concerned with the most obvious level.) Thus, it is for good reason we refer to the cellular universe. The cellular universe is modeled by the Dynamic Steady State Universe theory. This theory corresponds to what we experience and observe, incorporating the known repertoire of reality, an invariant order that is independent of our representation of it. And the key part of the repertoire of reality includes expanding, as well as contracting, aether medium. However, expansion and contraction in themselves do not ensure the manifestation of cells. The mode of expansion determines whether a universe is cellular or not. Most important is the requirement that on the large scale there be a regional separation between the process of expansion and the process of contraction. If the expansion is contained within cosmic sized ‘bubbles’, then aether expands within, but the structures themselves do not expand (see Fig. 2). While aether in the interior of the cosmic cells expands, the boundaries between cells limit the expansion. In fact the boundaries reverse the expansion by absorbing the medium flow —by contracting the aether that constitutes the flow. The effects of expansion (technically known as Lambda, Λ) and its dynamic opposite, contraction (familiarly known as gravitation), together, produce an endless flow of aether along with comoving mass. 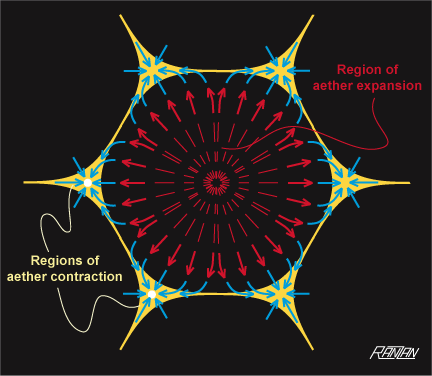 The dual-dynamic cosmic cells are somewhat like thermal convection cells except that aether does not circulate; rather it flows in a one-way pattern. The medium flows radially, then ‘sinks’ into what are called Voronoi cell boundaries. And since the cells with their dual-dynamic aether do not expand, then neither does the Universe. We can now address the question of why Official Cosmology insists on claiming that the universe IS expanding. The answer is not so much that it fails to recognize the significance of the cellular structure but more because it is missing the phenomenon of space contraction. And why is it missing? ... Because the BB theory of gravity is incomplete. The Dynamic Steady State Universe consists of cosmic cells —each approximately 300 million lightyears in diameter— within which Lambda is distinctly positive. 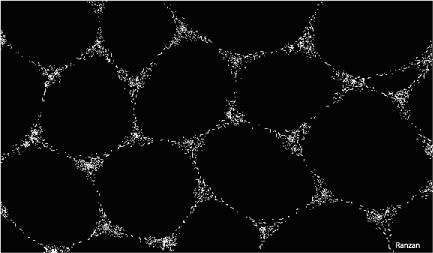 Although the space medium expands in the interior (the Void) of the cells, the cells themselves do not increase in size. At the boundaries of the cells, where contractile gravity dominates, space-medium expansion is reversed. The cells maintain ‘flow’ equilibrium; consequently the Universe does not expand. The cellular universe may be thought of as having a Euclidean 3-dimensional background space in which real structured space performs its dual dynamics —aether expansion and aether contraction. Fig. 2. Dual-dynamic aether in a cosmic cell. Schematic cross-section reveals the balanced flow of dynamically expanding aether and dynamically (and simultaneously) contracting aether. In conventional terminology, the void region where Lambda dominates (red arrows) is in equilibrium with the surrounding galaxy clusters (yellow) where contractile gravity dominates (blue arrows). From a deeper exploration than the brief excursion undertaken here, one finds that DSSU theory embraces a simple and elegant fact: The wonderful match between observation and theory is best achieved when one’s theory holds that the universe is more or less statically cellular and that the universe is correspondingly nonexpanding. By applying Nature's preferred mode of organizing itself, the numerous unresolved, and poorly resolved, problems of twentieth-century cosmology simply vanish. The DSSU cellular universe is uncompromisingly a nonexpanding universe and is contrary to the Official Cosmology, which decrees that the universe is expanding. Consequently the relevant journals refuse to publish. In the same way that aether and absolute motion are banned concepts in physics, the nonexpanding universe is a banned concept in astrophysics. The self-correcting mechanism seems to be failing. While Mainstream Cosmology is safeguarding the official truth irrespective of its validity, the DSSU theory of the dynamic equilibrium-universe is not reaching those who would benefit the most from its dissemination. In 1616 the Roman Catholic Church banned all books that maintain that the Earth moves. It was a desperate act to uphold the Christian religion's long held view that the Earth was stationary and the Heavens moved. The official doctrine that restrained the Earth’s motion was eventually rescinded. However, the doctrine that dictates the motion of the Heavens was not; it is still adhered to —but with a change of mode. Instead of declaring the divinely-perfect rotational-motion of the Heavens (manifest as concentric spheres), the doctrine now holds that the motion is a radial expansion of the Heavens. Yes, strange as it may seem, this represents the official position of the Church. In 1951 Pope Pius XII, who reigned during the period 1939-1958, presented to the Pontifical Academy a Paper, supported by the obligatory Scriptural evidence, in which the expanding universe popularly known as the Big Bang was decreed the blessed theory —the chosen theory of cosmology. Over the centuries the universities have replaced the former role of the churches as centers of higher learning. Sadly, restrictive codes defining the official truth still rule and often restrict the search for knowledge and suppress all deviations. In cosmology today, doubt and dissent are not tolerated, and young scientists learn to remain silent if they succumb to any unpure thoughts about the standard big bang model. Official religion at one time denied that the Earth moves; today the Official religion and its Big Bang believers deny that the aether moves. And worse, there are believers who deny the existence of the aether altogether. Nevertheless, the evidence is undeniable, space has a certain absoluteness quality; and furthermore, this space-fluid —the aether— has dynamic qualities. The science of cosmology during the last two centuries suffered truly devastating setbacks. The science of cosmology, due to the "ghastly errors" described herein, failed to reach maturity status. With the beginning of the third millennium came the rediscovery of the aether and the discovery of the causative mechanism of gravitation. Simultaneously, the theory of the nonexpanding cellular universe was developed. These three discoveries, when combined, constitute the New Cosmology. The science of cosmology is only now (in the 21st century), with tentative steps, transitioning into its modern form. The old pillar of space-medium expansion remains unaltered; the new pillars being added are the ubiquitous existence of aether, the mechanism of gravitation, and cosmic cellular structure. 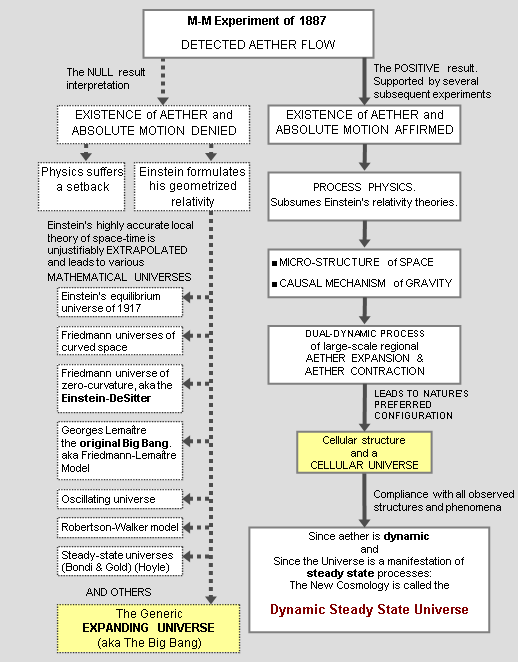 In the “impact of aether” flowchart (below) the left side outlines the well-known conventional story of the Michelson-Morley experiment and its impact on 20th-century cosmology. It is primarily a story of mathematical constructions. Note the unjustified extrapolation of Einstein’s highly accurate local theory of space-time. In contrast, the right side of the flowchart highlights the reality-based story of M-M and aether. The impact of the aether experiments involves not only forcing changes in the 20th-century concept of space and absolute motion but also the dramatic transforming of that century’s cosmology. The phenomenon of aether flow must now be recognized; space and motion have absoluteness qualities; space has structure. In physics, long-standing theories are being modified and subsumed. In cosmology, however, the full impact is nothing less than revolutionary and is yet to be realized. The aether experiments, having led to the true nature of space, and further, having led to the true nature of gravity, have now led to the true nature of the Cosmos. The Universe is a cellular steady-state universe —not an expansionary big-bang world. The considerable evidence is conclusive —we live in a nonexpanding cellular universe. The New Cosmology, the cosmology of the 21st century, represents a glorious simplification of the universe since it can now be understood as an infinite Euclidean expanse arranged into non-Euclidean regions. The new picture reveals a non-dynamic framework of regions of dual-dynamic aether. This article is an open-access article distributed under the terms and conditions of the Creative Commons Attribution License which permits unrestricted use, distribution, and reproduction in any medium, provided the original work is properly cited. R.T. Cahill, Space and Gravitation, Magister Botanicus, Vol.2 (Jan 2004). A.A. Michelson and E.W. Morley, On the Relative Motion of the Earth and the Luminiferous Ether, The American Journal of Science, Vol.34, No.203 (Nov 1887). R.T. Cahill, Absolute Motion and Gravitational Effects, Apeiron, Vol.11, No.1, pp53-111 (2004).